The Marion Motor Car Company of Indianapolis, Indiana, was founded in 1904. You might be thinking “This car sure looks like a Stutz Bearcat.” And you’d be right. Harry C. Stutz was the chief engineer at Marion until he left to form his own company in 1911. And by that time, he had already designed the Model 33 (or “Bobcat”) Speedster for Marion. He changed some things on his original design and built the car under his own name as the Bearcat beginning in 1912. The idea was simple: power was available, but cars of the period were heavy and had virtually no performance attributes. So Stutz stripped away those big heavy bodies and invented the sports car. The Marion Bobcat was produced from 1911 until 1913 and Marion was out of business in 1915. It’s a four-cylinder car and it has that super-cool “monocle” windscreen, with the third spotlight below it. These are legitimately rare cars and while a Stutz Bearcat will set you back about $300,000 – the prices for these cars are all over the place. I’ve seen one sell for $165,000 and one sell for less than $30,000. This one was restored over 30 years ago and is expected to sell for between $26,000-$39,000, which seems like an absolute steal. Click here for more info and here for more from Bonhams in Paris. 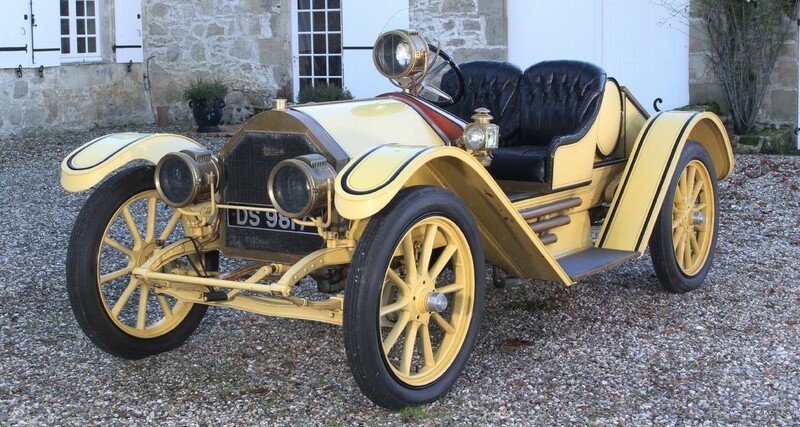 This entry was posted in Uncategorized and tagged 1911, auctions, bobcat, Bonhams, cars, classic cars, marion, model 33, speedster by classiccarweekly. Bookmark the permalink.